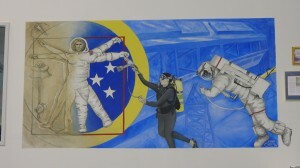 If you ever have a chance to visit NASA’s Neutral Buoyancy Laboratory (NBL) – and it’s well worth a visit – you will notice a brightly coloured painting on the wall of the main control room. On the left side is an unusual depiction of Leonardo da Vinci’s Vitruvian Man, which seamlessly fades into a human being in the same pose, but dressed in a white spacewalker’s EMU. That’s the Extravehicular Mobility Unit, or simply “the suit”. I love how this painting strikes a connection between human spaceflight and Leonardo, a figure who explored the potential of the human genius in engineering, art and the observation of nature. I wish I could somehow tell Leonardo that today not only we have flying machines – albeit quite different from the ones he envisioned – but human beings can even “walk” in space. And I wish he could fly on the Space Station and use his talent to tell and depict the story of those human beings up there. What I think is missing in Leonardo’s original drawing, however, is the connection between people, the idea of a collective endeavour. 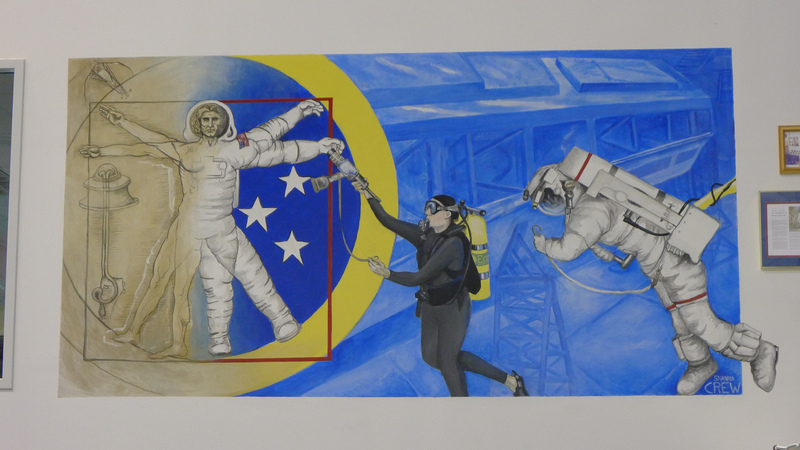 The NBL painting, on the contrary, is a tribute to the team, and in particular to some very special people: the NBL divers. Divers are our guardian angels in the water. First and foremost, they are in charge of our safety and are rigorously trained to respond to any suit emergency in an expeditious and effective manner to protect the life and health of the guys or girls entrusted to them. Life savers in an emergency situation, in a nominal EVA training run divers are instrumental in providing astronaut with smooth and effective training. Briefly, it is on their shoulders to make the gap between pool training and real weightlessness as small as possible. So, how do they do that? First of all, by means of a good weighout, the process of adding or removing weights and foam blocs from different locations of the suit to stabilize it in the water. When I’m in the suit, I really enjoy these moments, because I can relax as the divers spin me in different orientations to pinpoint residual tendencies of the suit to rotate. Another trick to fool gravity in the pool is to use low-fidelity, neutrally-buoyant substitutes for tools and replacement parts, as long as it is compatible with training objectives. For example, you might have noticed that spacewalking crewmembers carry a Power Grip Tool (PGT) tucked away on their right side. In the pool we carry a lighter, fake PGT during translations. When we need to use it, we retrieve the light PGT from the swing arm and hand it to a diver, who will promptly swap it for a higher-fidelity PGT that can actually drive fasteners. Yes, that’s what the diver is doing in the paining! 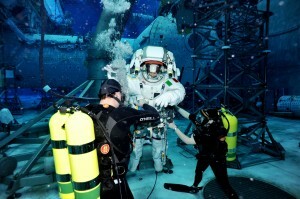 Throughout the run, divers will continuously help to offset the weight of high-fidelity tools and replacement units or stabilize the suits in orientations that happen to be unstable in the water in that particular moment. They operate the underwater cameras that record the action and feed live images to the control room. And they are a great source of invaluable feedback and suggestions, since many of them have supported countless EVA training runs over the course of many years at the NBL. Divers take charge of us in the moment we are lowered in the water. For a six-hour run, they work on three two-hour shifts, with the first-shift divers typically coming back in for the third shift. Also, remember that suits in the pool are supplied with Nitrox and cooling water from the surface via umbilicals. Divers manoeuvre the umbilicals out of our way and sometimes they will ask us to let go of structure and they will fly around a module or a truss segment to reroute them. I like these occasional brief breaks from the hard work. Not only I welcome the opportunity to rest for a minute or two, but immensely enjoy the bird’s eye view of the Space Station under water offered by the quick “flyarounds”. 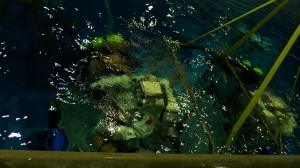 It’s an immense privilege to be able to train in the NBL. If it wasn’t for the suit, I would probably pinch myself once in a while. Thank you Samantha for your insight into the NBL! I’m pleased to know about all these tricks to fool the gravity. These divers deserve our strongest admiration for their job. Thanks for the blog, it’s a very interesting read. As a diver I wonder how you and the divers deal with decompression. As space walks can last 6 hours or more – do you train for these sort of durations? Or do do shorter sessions to simplify the decompressions requirements? Also, we all breath Nitrox. People in the suit are in there for the full duration, which is typically six hours. Divers work two-hour shifts. Should have guessed Nitrox. It’s also good for hangovers. Apparently… ;-). Dear Samatha, thanks for this blog! It’s so nice to be able to peek into an astronaut’s daily life and exercises. What a thoughtful post. I am continuously struck by how many astro/aquanauts are so attuned to aesthetics. Sure, everyone recognizes that you are all studious and disciplined and understand the mechanics and principles of all the science and tech that goes along with your career path; but time and again its that passion for the beauty of the world that draws the rest of us in-the photography, the writing, the poetry, and even the choreography of a weightless dance. You are able to demonstrate the intertwining of both science and beauty so well! I really look forward to your Expedition in 2014! Please plan on blogging and tweeting! thanks for your message and your passion for space! I certainly hope that I’ll be able to blog and tweet during Expedition 42/43! Hi Samantha, thanks for the great info. I have a question. If the divers don’t need to undergo decompression — why is there a decompression chamber on site? Have there been any instances were someone has gotten the bends and had to use the chamber?